Explore La Romana: Dom Ham – darn good burgers! In our humble opinion, Carlitos Pichardo’s Dom Ham not only fulfills all these basic criteria, but exceeds all expectations: the burgers are simply sensational! By far the best thing, but by no means the only good thing about Dom Ham is its mouth watering beef burgers. While this is only our humblest of opinions, we are confident that any burger-lover or indeed lover of good food will agree – Dom Ham rocks! Located a mere five minutes from the gates of Casa de Campo in La Romana, one street up from the Clinica Canela (Calle Altragracia Esq. Benito Moncion. ), Dom Ham, is a no frills open air establishment, with its own parking, thatched roof and unique decor. If you’re looking for chic and trendy, this is no place for you – this is a place to find a serious burger, sausages and a real German Weiss Beer! German weiss beer, while a favorite of ours (and one we strongly recommend), is only one of 19 different types of ale you can enjoy. As far as we know, Dom Ham has La Romana’s most complete selection of beers, making it an ideal place to go and watch baseball, football or other sporting event on the large flatscreen TV mounted over the bar. As for the food. Ooh the food! The burgers are simply divine! The sausages are brought in from Santo Domingo – direct from an authentic German butcher. While it is hard to say how authentic they really are, we can say they are simply delicious, try a little with their fresh garlic bread while waiting for your burger and enjoying your Weiss beer and you will not be disappointed. So you’ve had a great meal, watched a ball game, enjoyed a few imported cervesas and you ask for the bill. What should can expect? Less than you would imagine. The most expensive German beer is around RD$150 or so, and a bacon cheeseburger slightly less. A hearty dinner for two would set you back no more than a single appetizer at some other establishments, making this an ideal place to go for a quick lunch or dinner any day of the week. BTW – did we mention they also have free WiFi? We are also aware that places change constantly, so if a place we have reviewed no longer has the level of quality that we described – please leave us a comment! Its important to keep everyone safe and enjoying only the best! 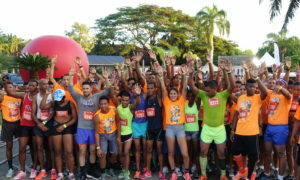 Are you a Casa de Campo Corre supporter? Only in the DR: Salami a domicilio! Construction in Casa: Rebuilding the hotel!